Personalised white cotton baby grow with easy popper fastening. Personalised white cotton baby grow with easy popper fastening. A must have gift for all babies that can be tailor made with a name or little message of your choice, this cotton babywear is a super keepsake for the future. Long sleeved with poppers down the front and around the crotch for simple changing. Personalised white cotton baby grow with easy popper fastening. A must have gift for all babies that can be tailor made with a name or little message of your choice, this cotton babywear is a super keepsake for the future. Long sleeved with poppers down the front and around the crotch for simple changing. 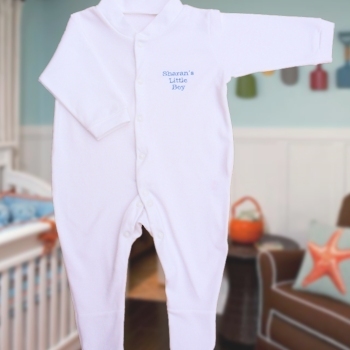 Make your adorable baby all the more gorgeous with a personalised cotton baby grow. Simply choose the text and the thread colour you want the name sewn in, to make your loved one stand out from the crowd. Size: Premature (Tiny Baby), Newborn (First Size), 0-3 Months, 3-6 Months, 6-12 Months, 12-18 Months, 18-24 Months, 2-3 Years.